Every year at the start of Holy Week, I find myself silently uttering the same question: how in the world did Jesus go from being seen as a coming King who should rule and reign to a hardened criminal who should suffer and die in just 4 days? How does that work? How do the tables turn that fast? If you read Matthew’s account of Holy Week, he spends the final third of his entire gospel walking through this single week. Jesus comes in hot, entering Jerusalem and immediately going to cleanse the temple (Matthew 21:12). You could say that the first couple of days in Holy Week show the most combative and confrontational Jesus that we see in his entire ministry. Any time the Pharisees challenged him or tried to corner him in a verbal spat, he immediately and effectively shuts them down in a variety of complex and weighty topics. Jesus is so vocal with them that we read in Matthew 22:46, “And no one was able to answer him a word, nor from that day did anyone dare to ask him any more questions”. He completely silences them, and then proceeds to go on an aggressive and long tirade famously known as the “seven woes to the Pharisees” (Matthew 23:1-36). So the Pharisees and Sadducees are angry, we know why they would want to kill Jesus so quickly, but the crowds were so in awe of him. They were so amazed by his teaching and authority, that the Pharisees didn’t have a leg to stand on (Matthew 26:5). Two days into the week, and there still is no reason to think that the cross was near. But as you continue to read Matthew’s narrative, you see the turning point in chapter 26, and it wasn’t a shrewd move by the Pharisees, nor was it a grave misstep by Jesus. It was when Jesus himself said in Matthew 26:2 “You know that after two days the Passover is coming, and the Son of Man will be delivered up to be crucified”. Jesus knew it was time and that he was sent for a purpose. What happens over the next 2 days is not that the Pharisees got smart, or that Jesus makes a mistake by getting overconfident, but rather Jesus allows it to happen because this is the eternal plan of God that has been in place since the beginning. A common, yet very wrong impression of Good Friday that often gets painted is that Satan pulled a right hook on God, putting him on the ropes by killing his Son. That this was a victory for the enemy and it’s not until God salvages the situation days later on Easter that He finally overcomes his enemy. This impression is high on drama, but low on truth. Jesus went to the cross, because God sent him into the world for this purpose. The path of the cross was not a wrench thrown into God’s good plan, for God’s good and right plan was accomplished through the path of the cross. Jesus sweating blood in the Garden before he gets arrested is not fear of man, but it’s his human nature dreading the cup he is about to drink. The cup of wrath from the Father as the punishment due sinners being poured onto the Son. Yet, his divine nature knows this is not a helpless Son appeasing an angry Father, this is a willful Son agreeing to carry out the purposes of a loving Father. For God so loved the world, that he sent his one and only Son – and this Son, existing for all of eternity, put on a human nature willingly so that sinners can be reconciled back to the Father. Wrath is not the enemy of love, for it only can only exist because of love. There is no possibility of wrath without love. But here’s what I really want to point out in the text. Jesus gets arrested, and that very night he comes before the high priest, Caiaphas and his council. Matthew 26:59 says, “Now the chief priests and the whole council were seeking false testimony against Jesus that they may put him to death, but they found none, though many false witnesses came forward.” They are so out of sorts in this kangaroo court, that not only were they seeking false testimony against Jesus, but they couldn’t even get that! And yet Caiaphas demands that Jesus speak in response to these ridiculous allegations, and in v63, we read, “but Jesus remained silent.” If Jesus wanted to shut this down, he could have easily done so, as we saw him effectively shoot down the Pharisees just days earlier, but now, he’s silent. Here’s why, and it’s sobering: The silence of Jesus was not a result of his shortfalls, but ours. He refused to speak not because of his sin and shame, but because his purpose was to go to the cross and pay for our sins and our shame. And the only way he would get to the cross is if he remained silent in the face of false accusations. Because of his silence, the chief priests were able to slowly sway the crowd that once chanted “Hosanna!” and get them to now chant “crucify him!” just 4 days later. The gravity and weight of Holy Week points to the gravity and weight of sin, and how serious it really is. It’s so serious that the brutal crucifixion of Jesus, the perfect Son of God, is the only possible way it could be atoned for. 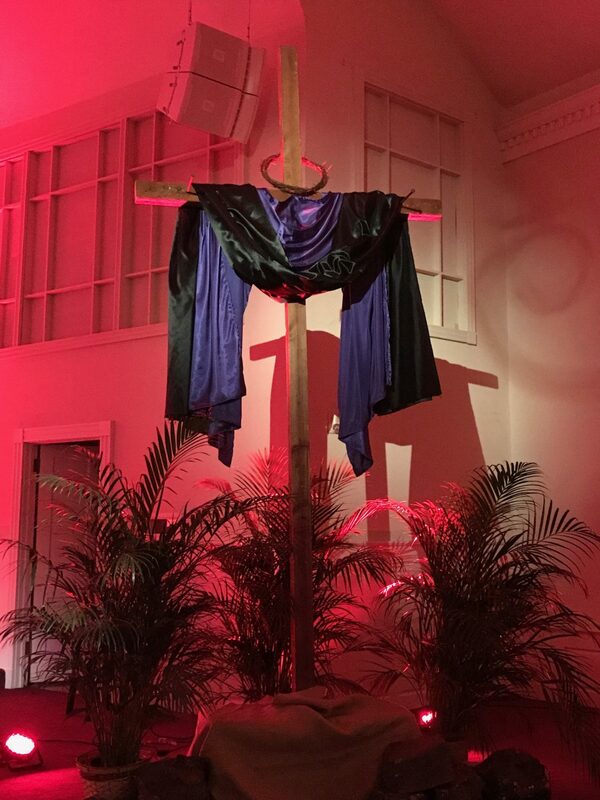 The sorrow of Good Friday does not come because of a victory for the enemy, but rather the sorrow comes because we see the true gravity and deadly nature of our sin. It’s ugly. It leads to death. Let Good Friday and Holy Saturday be an annual reminder that we ought to never make peace with sin, never get comfortable with it, never isolate ourselves from God’s people so that we can easily justify it. Let the need for the cross make us sad because of the fact that it’s our sin that put him there, and let it simultaneously make us grateful that Jesus loved us so much that he stayed silent when he probably wanted to speak most. The silence of Jesus shows us that it’s not just what he did on the cross, but what he didn’t do in order to get there. And it is at the cross where two seemingly opposite emotions come crashing together. Where it makes us sorrowful to consider what we’ve done to put him there, suffering at the hand of His Father, and where it fills us with joy and comfort to consider what he’s done to bring us here, righteous and holy before His Father. So whenever we partake of the Lord’s Supper, may our hands tremble whenever we hold the bread and grasp the cup as we consider both the sorrow and the joy of the cross of Jesus Christ, representing the sacrifice and the love of the Father for those who believe in Him.